Being a big family of six with a small garden, we had to think carefully on how the dining area would look for The Chans. We decided to give the family this fabulous curved rattan dining set designed by Katie Blake, donated from Oaktree Garden Centre and Nursery. The round table reflects the upcycled trampoline rings that we used to give the garden that extra bit of height. This dining set can easily accommodate the entire family with that little bit of extra room for guests. The generous size table is 150cm round and features a free Lazy Susy with full rattan weave top and glass. The bright cushion look great against the grey rattan and the whole set look comfortable on our composite decking. Every item in the Katie Blake range is hand made with great care and is easy to look after with no maintenance other than occasional cleaning. Glencrest an extensive outdoor garden living collection ideal for the garden or conservatory.With some 30 years experience, you can be certain that Glencrest Seatex have your comfort and enjoyment in mind whether entertaining friends on the patio or decking, dining outdoors or just relaxing in the garden. The Chan girls love to sun bath and the best place to do this in their garden was the one corner where the raised bed was constructed. We gave them two beautiful Marrakech loungers from the company Hartman. The loungers are light and easy for the girls to move around with the sun. The colour of the loungers really makes them stand out against the fencing and other hard landscaping. The Marrakech lounger is crafted from cast aluminium; it has a tilted backrest which adjusts to four lounging positions. It comes complete with deeply padded reversible cushion. 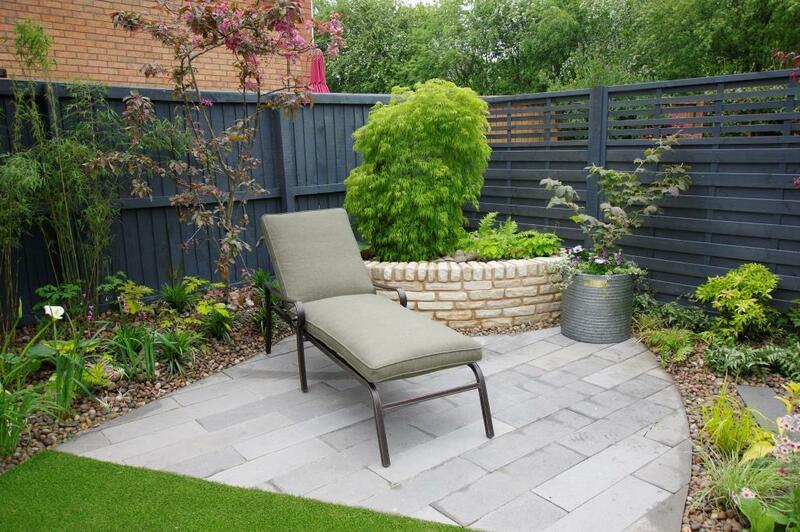 Lightweight, strong and virtually maintenance free, it makes a perfect relaxing spot from which the Chan family can really love their garden! 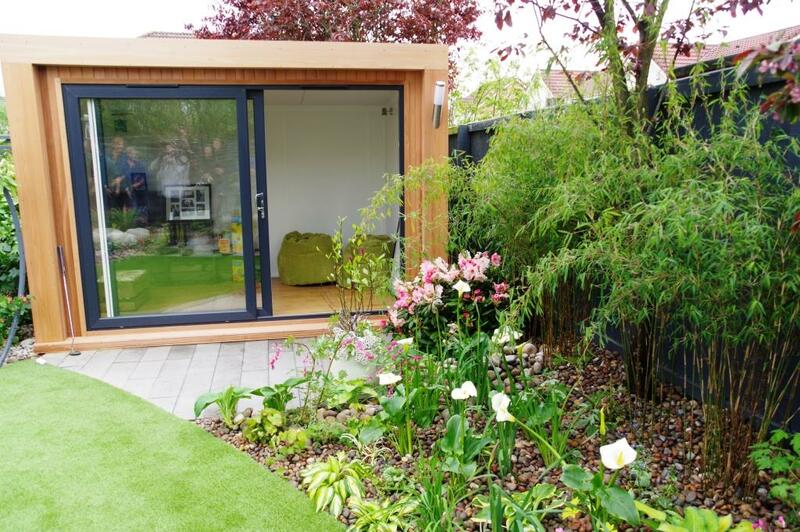 As Amelie suffers from Charge Syndrome, a debilitating condition which has left her deaf, partially sighted and needing constant care, we wanted to give her somewhere to shelter from the sun without taking up too much precious space in the garden. This amazing garden building lets the rest of the family enjoy the garden whilst Amelie is safe and playing out of the sun’s rays. 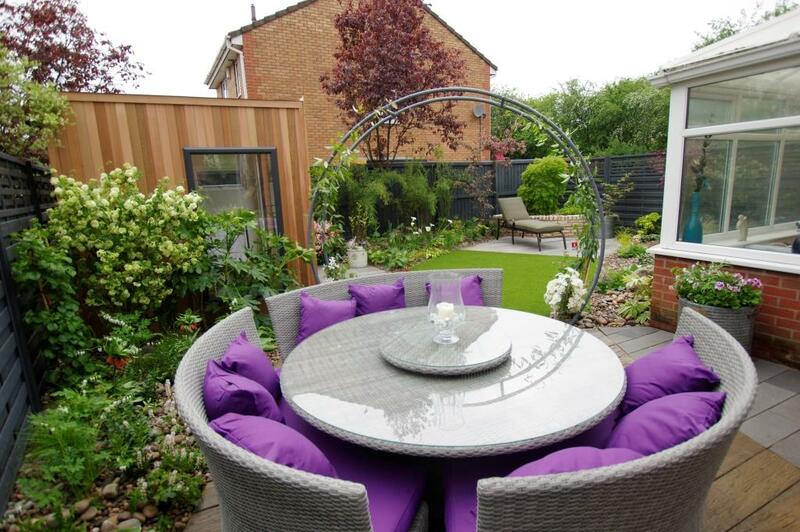 This space will also act as a pirate retreat in the garden for any of the family to escape whatever the weather. The building was kindly donated to the family by the company Green Retreats. The retreat was from the inspiration range and comes fully insulated and has internal and external lighting. The bi-folding doors do not take any space away from the garden and the red cedar wood will age to a lovely grey colour. All in all a beautiful addition to any garden that wants a cool contemporary look. Darren Chan had constructed his own softwood decking for the garden. However, with the garden being in shade for most of the day and Darren busy looking after Amelie the decking had become a bit of a hazard. Algae was growing all over it and this meant that Amelie and others were at risk of slipping. We wanted to show people that even in the shade you can have that decking look without the maintenance. Decking company Millboard produces a great weathered vintage composite decking which they kindly donated to the garden build. This composite decking is easy to install and has very minimal maintenance as algae struggles to grow on the surface. It is a resin-mineral composite decking board; a quality and durable alternative to wood plastic composite. It is anti slip, stain/fade resistant and very low maintenance. 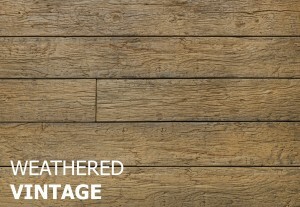 The weathered decking boards add character and style, these charming boards are available in two colours, create areas of timeless beauty, having been moulded from hand-picked antique oak boards. Lesley Chan absolutely loves Acer trees and what else would make such a lovely focal point in the garden than this Acer palmate ‘Palmatifidum’. The garden will give the perfect shelter for this beautiful Acer to grow and flourish. The weeping tree with attractive, small deeply cut lobed emerald green leaves looks stunning against the contemporary style gun metal coloured fencing. The leaves of this tree will turn an eye-catching yellow-orange in late autumn. This Japanese maple prefers a partially shady position in rich, moist but well drained soil. 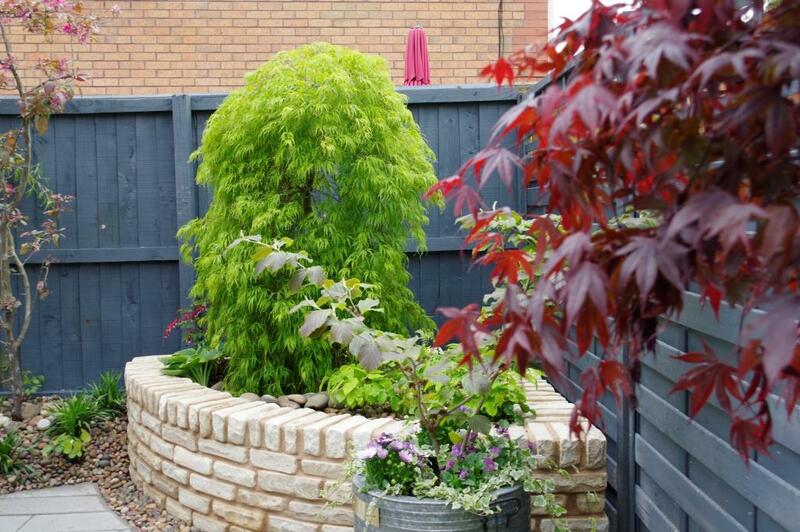 This exquisite addition to the garden was given to us by Ornamental trees, an excellent company that will give you friendly and great advice on any ornamental tree you require.